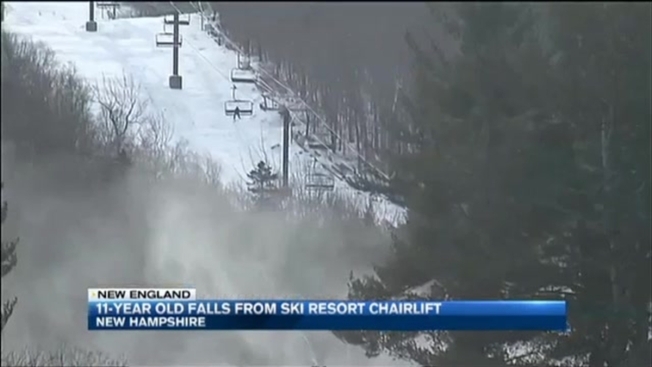 A miracle on a New Hampshire ski mountain - that's what one father is saying, after his 11-year-old child survived a 25-foot fall from a chairlift. "At that moment, his life was in my hands, and my hands gave out," Doug Prangley of Nashua told necn Monday. It was the last run of the day when Prangley found himself desperately gripping the jacket of his son, who was dangling from the chairlift. "At one point, as my hands are starting to tire out, I know what's going to happen, and I just looked at him and I said, 'I love you and I am sorry,' and my hands gave out and he dropped," Prangley recalled through tears. He says the nightmare started Saturday afternoon as he loaded the high-speed chairlift at Ragged Mountain with his 11-year-old twins Christopher and Cameron. He says Cameron slipped before they got the safety bar down. "At 10, 15, 20 feet in the air, I turned back and screamed for help, and no one was there," Prangley said. "There was no one operating it." In a statement Monday, Ragged Mountain Spokesperson Mark Fischer wrote, "There were two lift operators on duty per normal protocol, one in the base terminal and one at the top terminal. No misloads were observed." Prangley says by the time Cam slipped from his grip, they were at least 25 feet high. "That look in his eyes will never go away," Prangley said. Cameron survived with only a concussion and was talking by the time his dad reached him on the ungroomed trail. "He was with it and he looked at me and said, 'Daddy it's not your fault,'" Prangley said. "You're supposed to be there for your kids you're supposed to never let them down," he said. "I let go of him, and I let him down because I couldn't hold him." Prangley says eventually he'll also let go of the guilt and he and his boys will hit the slopes again. "That first time going up is going to be really scary, but I will do it, I will do it for my kids because it won't define us, I refuse to have it define us," Prangley said. Cameron was wearing a helmet. A decision doctors say likely saved his life.